Fresh New Day » Trk! Other than the bright blue skies on those magical clear days, Wellington is not a brightly coloured city. That’s not to say that the town is colourless, rather that Wellington specialises in a fine range of muted tones. The combinations are often subtle, but often very beautiful. There’s also a rich fusion of Victorian and more modern architectural styles – it’s terrific – very inspirational. As I walk around hunting for the elusive shot of the day, I wonder what the stories are behind the façades and windows. 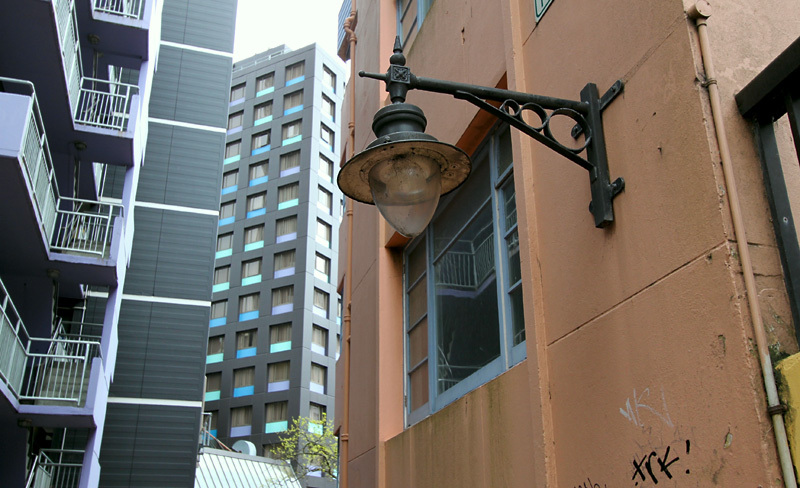 If this building was in use by time travellers, is this the light fitting they’d use? 36. Every day be still. Connect to your inner being. Listen and be guided by it. 41. Every day use your mind. It is the greatest technology ever created. 45. Every day you are a different person. 19 Sep This entry was written by Lynsey, posted on September 19, 2011 at 10:53 pm, filed under architecture, creativity, exploring, graffiti, gratitude, photography, public art, seeing, street entertainment, Wellington and tagged architect, days, hunting, inspiration, light, magic, time, travel, victorian. Bookmark the permalink. Follow any comments here with the RSS feed for this post. Post a comment or leave a trackback: Trackback URL.